Configure the station setup for each Lightspeed OnSite station. Some of your stations can serve different roles or use different hardware, so configure each station separately. In OnSite go to File > Station Setup. Choose the default printing mode for the station. This depends on whether you're going to be mostly printing receipts from it, or full page documents such as invoices. 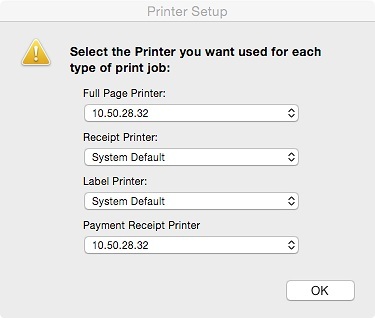 Click Printer Setup and select the printer you want to use for each type of print job. NOTE: You must define a full page printer. From the menus choose your card swipe, cash drawer, and pole display if applicable. If you operate in a fast-paced cash environment, for Default Search choose Scan or Type Product and for Default Customer Type choose Walk In. If you like to have an account for each customer, you can change Default Search to Type Customer and set Default Customer Type as Customer. From Default Tax Code choose the default tax code you defined in Configuring taxes. If you need help finding your default tax code, go to Tools > Setup > Basics > Taxes and look for the top tax code in the Tax Code list.